Add olive oil to a large skillet over medium heat. 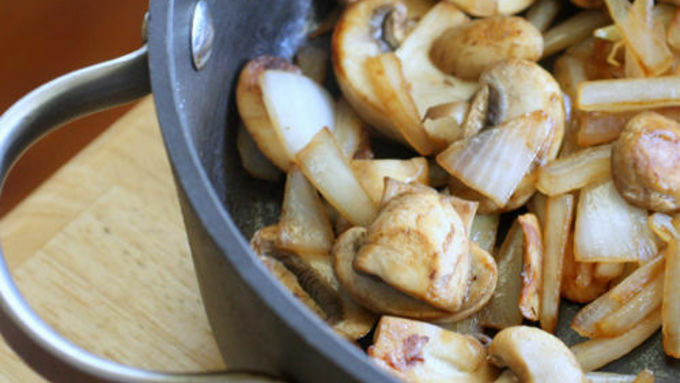 Add onions and mushrooms and cook for 10 minutes or until vegetables are soft. Add marsala wine and sliced chicken and cook a couple minutes or until wine reduces. Place slices of cheese over chicken mixture and let sit for one minute or until melted. Warm tortillas in microwave and then place 1/4 of the chicken mixure down the middle of the wrap and roll like a burrito. Slice in half and enjoy! Gourmet sandwich wraps seem to be a new trend emerging these days. Whether it’s Sesame Chicken or Chicken Parmesan, people are wrapping up gourmet entrées in tortillas and hauling them to work or school for lunch. 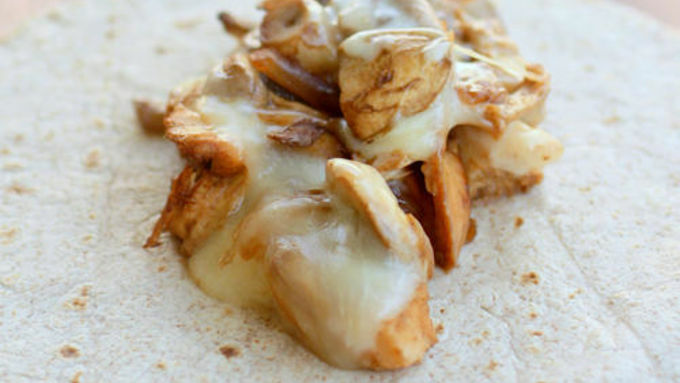 I have always loved Chicken Marsala and thought, "Why not roll up the goodness of my favorite entrée into a wrap?" So this Gourmet Chicken Marsala Wrap was born. A couple of years ago I wanted to surprise my honey at work for Valentine’s Day with lunch, but I had a hard time coming up with food ideas that were portable and still fancy enough for the special day. This is a seriously tasty wrap that, paired with a green salad, would be a perfect romantic lunch with your loved one. Wish I had this wrap in my repertoire back then! 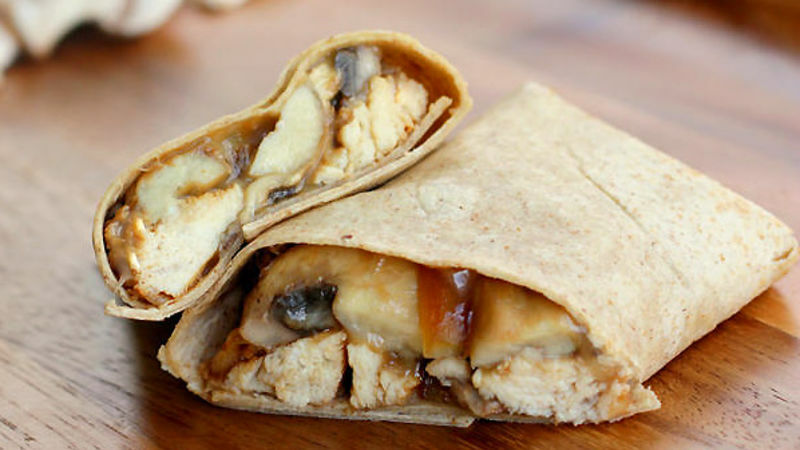 These Gourmet Chicken Marsala Wraps are really simple. First, sauté some onions and mushrooms until soft. Then, add some Marsala wine, chicken, and Provolone cheese. Right about here you will want to devour the whole pan because the smell of the wine and mushrooms will send your taste buds into a frenzy. Next, pour the mixture down the middle of a warmed tortilla. Wrap it all up, and in less than twenty minutes you have a gourmet lunch to impress your loved one…or just yourself.